ROTLICHT is an encounter between two artists who have each long found their own original voice and won multiple awards for their work. What their works have in common is an immediate, sensual impact on our perception. Their artistic exploration and collaboration produced a multi-part cross-genre performance that unites choreography, composition, live electronics and improvisation. 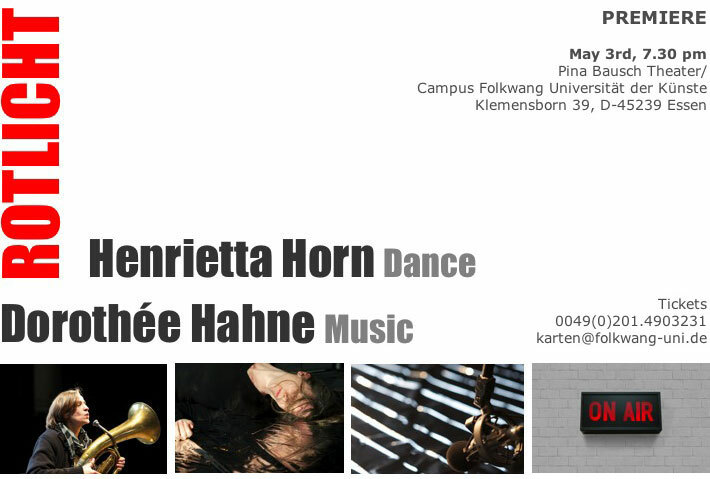 Henrietta Horn, long-term artistic director of the Folkwang Tanzstudio, has been working as a freelance choreographer, dancer and teacher since the end of 2008. Dorothée Hahne is a composer, musician and publisher. She gives performances and concerts in museums, galleries and churches, creates instrumental and electronic compositions, film scores, poetry scores and audio drama projects.